I made this art to celebrate the birthday of one of my alltime favorite characters, Judai Yuki from Yu-Gi-Oh GX. Today is his birthday and I wanted to celebrate by making a tribute art for him. 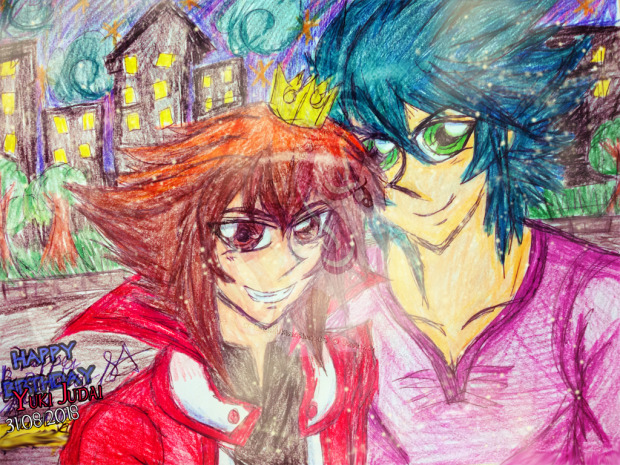 Johan Anderson is also in the drawing because he is one of Judai's best friends and who better to celebrate Judai's birthday with Judai other than Johan. Not much else to say other than enjoy the art. I am planning on making a birthday tribute for Ryou Bakura soon, his birthday is September 2nd. More art to come soon. Busy with college. Thanks for viewing/favoriting/commenting. Your support of my work is always appreciated.